Kajal Kumar Biswas | I.K International Publishing House Pvt. 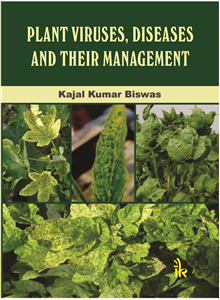 Ltd.
Dr. Kajal Kumar Biswas, presently working as Principal Scientist, Advanced Centre of Plant Virology, Division of Plant Pathology, Indian Agricutural Research Institute (IARI), New Delhi, did his M.Sc (Ag) in Plant Pathology in Bidhan Chandra Krishi Viswavidyalaya, Mohanpur in 1992, and PhD in Plant Pathology (Plant Virology) at Indian Agricultural Research Institute (IARI), New Delhi in 1997. He has been involved in doing research in plant research during last 24 years and teaching and guiding MSc. and PhD students in Plant Virology. He did his Post Doctorate in advanced molecular plant virology in University of Florida, Gainesville, USA during 2002-2004. He has also worked in Central Research Institute for Dryland Agriculture (CRIDA), Hyderabad as Scientist and IARI-Regional Station, Kalimpong as Senior Scientist and In-charge. He has been awarded the Prof. M. J. Narashimhan Academic Award by Indian Phytopathological Society (IPS), New Delhi (1999); FPSI (Fellow of IPS) (2012), New Delhi; SPPS Meritorious Scientist Award by Society of Plant Protection Society, New Delhi (2010); Shiksha Ratan Puraskar, India International Friendship Society, New Delhi ((2011); Editor (Plant Virology) (2014), IPS, New Delhi. He has published 40 research papers, 10 book chapters, one training manuals, 41 research abstracts in National and International Symposia, and attended 23 National and International Symposia.